Bivouac has made the most of a stakes race opportunity at Randwick after missing the Golden Slipper. Bivouac has led home a Cummings-family trifecta in the Kindergarten Stakes at Randwick with James getting the verdict over father Anthony in the opening race on day one of The Championships. The Godolphin colt was given a beautiful run by Blake Shinn and surged to the front halfway up the straight to score comfortably by two lengths over first starter Libertini with the winner’s stablemate Athiri another half-neck away third. “I haven’t had a trifecta yet but we have a Cummings trifecta so that will have to do,” James Cummings said. Bivouac was first emergency for the Golden Slipper but didn’t gain a start. Cummings thought the youngster would have been a good chance in the two-year-feature, which the stable won with Kiamichi, but he was happy with to take a consolation win on Saturday. “He would have but small fish make sweet eating,” Cummings said. 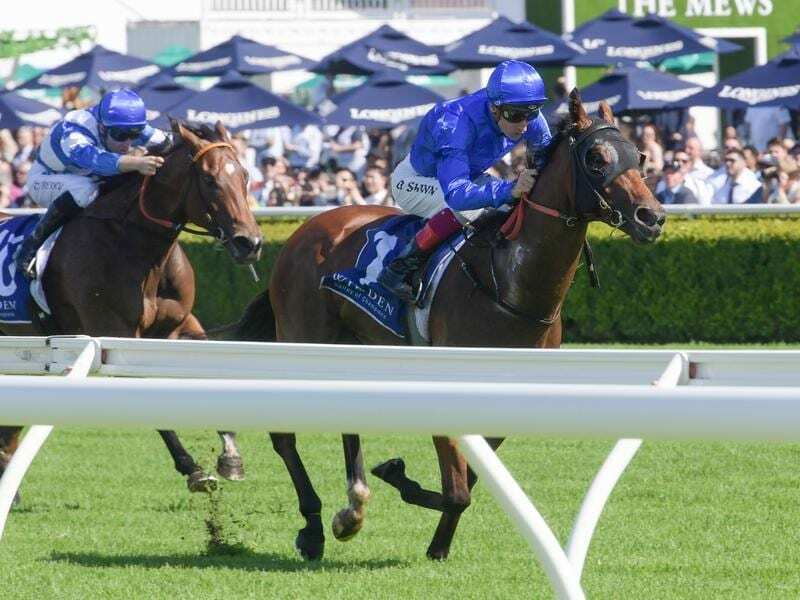 Cummings also revealed Shinn had felt Bivouac would have been a strong chance in the Group One Sires’ Produce Stakes (1400m) later on the Randwick card but after tossing the idea around, the Godolphin team opted to run him over the shorter 1100 metre journey of the Kindergarten. The colt’s win continued a stellar two-year-old season for Godolphin who has made a clean sweep of the juvenile feature races winning the Magic Millions Classic with Exhilarates, Blue Diamond Stakes with Lyre and Golden Slipper, along with a host of stakes races. Cummings confirmed Athiri would be better suited on firmer ground and could back up in the Percy Sykes Stakes (1200m) at Randwick next Saturday.